Witnessing at a Mormon temple opening! Way back in the week of August 21-26, 2000, a stream of Christians converged on Gardendale, Alabama (which is a suburb of Birmingham) because the Church of Jesus Christ of Latter-Day Saints had just completed a temple there, and it was "open house" week for visitors. Anyone - not just worthy Mormons - could obtain a glimpse inside one of their secretive temples. 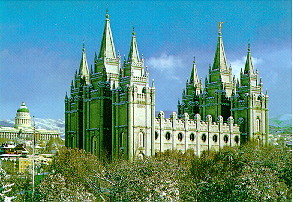 For many Mormons it would be their only opportunity to be in one, since so many of them never obtain a "temple recommend", which is a strict requirement for entrance. Although Christians were handing out fliers and gospel literature all week there, I only made it on the last day of the week open for visitors, a Saturday. It was a good experience for me, and it gave me an opportunity to take the gospel to the Mormons for a change, instead of them coming to my door! A good group of believers showed up for the opening - I would say around 20 or so. We all took the opportunity to either hand out literature on Mormonism or hold signs (such as "Mormons believe that Jesus and Satan are brothers. Do you?"). Many drivers on the highway would slow down just to read our signs. The reception that the road traffic gave to our literature was mixed. About half to two-thirds were Mormons, and they generally didn't take our information (perhaps they were warned ahead of time?) I did get a few backhanded comments from Mormons driving by - what I call the "yell-and-run" tactic, since they would bark a pro-Mormon comment at me, then hit the gas, giving me no time to respond. Most of the non-Mormon people did take some literature, especially when they stopped next to us at a stoplight. If nothing else, we alerted those unaware of Mormon doctrine of its biblical errors. The local television station sent out a camera crew to film our "protest", and they interviewed Bob Waldrop, who was the unofficial head of our outreach for the week. He's on staff at Watchman Fellowship in Birmingham, which is a national counter-cult ministry. We also had two young Christian men come up all the way from Pensacola, Florida just for the event. They were determined to do some street preaching, and they certainly had bullhorns for voices. They moved from corner to corner, preaching the gospel message at the top of their lungs. They then moved to the driveway next to the entrance and started preaching, which was the last straw, so to speak, for the LDS leaders. They immediately called the police, and when they arrived the LDS higher-ups, decked in suits, came out and had a conference-huddle with the police, while the two preachers continued their preaching. Eventually, the police gave the young men an ultimatum: shut-up or be arrested for disturbing the peace. The two street preachers got the message and left, admitting that their time there was up anyway (they had to get on the road back to Pensacola, they said). I wasn't about to criticize their methods. Who am I to say that a particular way of sharing the gospel is wrong? Praise God that it's being voiced! It was interesting to note that the LDS leaders initially had sent their people down the driveway next to the protesters in order to get "equal time" in when the Christians were handing out literature. However, the Christian protesters at once went to work on the Mormons, sharing the true gospel with them and pointing out the errors of Mormon doctrine. Once the Mormon leaders got wind of this, they hastily changed their minds and had their people retreat back up the driveway! And elsewhere, whenever a protester would move next to a Mormon and start talking about Mormonism, the Mormon would immediately leave and move further up the hill! It seems that the LDS leaders don't want any kind of dialogue with Christians knowledgeable about Mormonism. I wonder why? The Birmingham temple seen from the road. Watchman Fellowship's temple information tent for the public, which was across the street from the temple. The two street preachers, standing just to the left of the truck, and just before the police arrived.